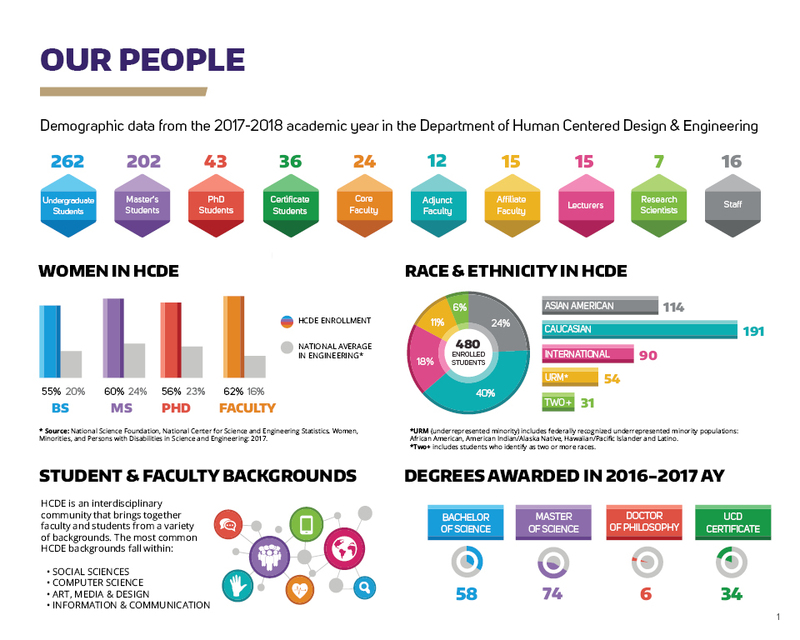 The department of Human Centered Design & Engineering (HCDE) at the University of Washington is committed to fostering a supportive environment for diverse students, faculty, and staff. We recognize that it is essential to identify and educate diverse students in order to achieve our goal of remaining an elite, internationally recognized leader in human centered design and engineering. At the heart of HCDE research, theory, and practice lies a shared understanding of the importance of people as users and consumers of information and technology. To ensure that our research, theory, and practice are always on the forefront of the user experience, we must reflect the diversity of our society. To that end, we are committed to identifying, recruiting, and retaining diverse faculty, staff, and students with respect to race, ethnicity, gender, age, sexual and gender identity/orientation, disability, religion, culture, socio-economic status, and geography. Contains diversity mission statement for the college and a list of diversity initiatives, along with contact information. Resources for prospective and current engineering students. Information, support and resources for minority students seeking graduate study at the UW. We believe that students from all economic backgrounds should have the opportunity to attend the University of Washington. Finances should not be a barrier to getting an education. A central resource for many of the UW's campus wide diversity outreach, recruitment and retention programs. The Q Center facilitates and enhances an open, safe, inclusive, and celebratory environment for bisexual, lesbian, gay, queer, Two-spirit, transgender, intersex, questioning, same-gender-loving, differently oriented, and allied students, faculty, and staff. DRS is dedicated to ensuring access and inclusion for all undergraduate, graduate, professional, Evening Degree and Access program students with disabilities on the Seattle campus. University of Washington's home page for campus wide diversity information. Calendar of events and resources for faculty, staff and students. Home page for the UW's Women's Center which includes classes, programs and events designed to better the lives of women, men, girls and boys through education and community involvement.